Am Samstag unterstützen wir mit unserer Musik die friedlichen Proteste in Stuttgart. 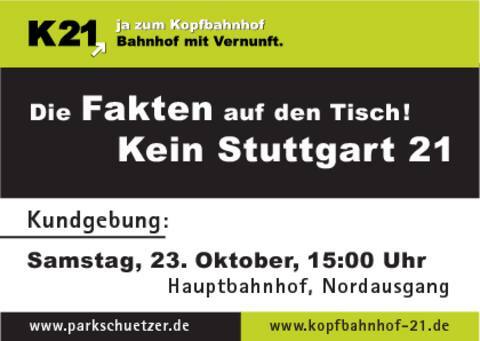 Die Kundgebung mit unserem musikalischen Beitrag findet am Nordausgang des Hauptbahnhofes statt Am Rednerpult steht unter Anderem Karl-Peter Neumann, Bundesvorsitzender des Fahrgastverbandes PRO BAHN. Die Maulwürfe im Schlossgarten dürfen witterungsbedingt am Samstag ausschlafen und die Kundgebung findet statdessen am Hauptbahnhof (Nordausgang) statt. Gegen 15 Uhr geht's los. Das Thema lautet: "Alle Fakten auf den Tisch." 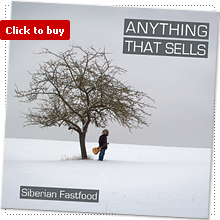 Welcome to the new Siberian Fastfood web site! While the band is practicing and preparing hard for upcoming concerts, our web designers created a new Siberian Fastfood web site so that you have something new to play with! The site is now based on the CMS joomla! with functionality to share news on facebook, twitter, google, etc. Also, we have a new shop system that allows you to order our music worldwide. Subscribing to the RSS feed at the bottom left of the page will get the latest news to you in time. The greatest special deal is: You can now listen to the entire Anything That Sells album for free on this web site! Use the player on the start page for that. If you click the link below the player, a popup version of the playlist will open and you can continue to surf on the internet while you are listening to the music. Many thanks for building the site to Philip Platz, Artem Vladimirov and Volker Sachse. Have a lot of fun with the site! Feedback welcome! Stay tuned! Siberian Fastfood is "Newcomer of the month"
Radio contest on bigFM !